Welcome back to the PingSunday tutorial of coach EmRatThich. Summer is finished. The new league season has started. Today, we study the table tennis lessons for novice players. If a new player comes to me and asks me to correct his technique. I will first ask him to learn the 10 basic skills in table tennis. Then I will explain him this first ping pong lessons. There is also an online table tennis course that you can take to improve your skills. What is the hand calluses? So what is the first lesson that I can give him? Or which part of his technique that I will look at first? For me, the first thing I want to correct is “Does he hold the racket correctly?”. This is the first lesson that every new player should know. I will look at this hand and the grip first. the bad grip will become the bad habit. And it’s very difficult to correct it later. Remember: You will never improve with a wrong grip. Unfortunately, I still see many new players who don’t know how to hold the racket correctly. Holding the racket is like the ABC lesson. It’s the base, the fundamental of your technique. If you don’t know to hold the bat correctly like the player in this video, no need to train furthermore. It’s like a waste of time. But they say “No!” or “Not interested in my question”. An experienced coach just needs to see the hand calluses and can tell you if you have a good grip or not. He also can guess that if you are a forehand or backhand dominant player. Look at your hand! You will know your playing style! The hand calluses are the dead, the hardern skins on your hand. The calluses are formed at the place that you apply the pressure, so it’s like a fingerprint of your playing style. The good players will have the similar calluses. So If you come to me, my first question is “Show me your hand, show me how you hold the racket”. Look at your playing hand, I will explain it right now. This is my hand. Now let’s see what is the calluses patterns on a correct grip. You can clearly see the calluses. There are 3 calluses on the bottom of the little finger, ring finger and middle finger. A good coach by just watching your hands can guess exactly your playing style. He doesn’t even need to watch you play. Amazing? Right? And there is also the callus on the side of my little finger. So these calluses are called the “holding calluses”. They are formed because you hold the handle of the racket. So every player should have these same calluses positions. But look! I don’t have the callus on the bottom of my index finger. But if you have a callus here, that means you have a bad grip or you don’t know how to hold the racket. I guess that if you can see the hand of Ma Long or Zhang Jike, they won’t have the callus on the index finger neither. Now, let’s see the “pressure calluses”. Turn back your hand, and look at your thumb. You should see one or two calluses on your thumb. These calluses are formed because you apply the pressure while doing the stroke. These calluses are the fingerprint of your playing style. If you have a big callus on the base of your thumb, you are a forehand dominant player. Forehand players should practice the best tactics to serve and attack. But if you have a bigger callus on the side of your thumb, you are the backhand dominant player. So only by seeing my hand calluses, I can conclude that I’m a forehand player, who prefers using my forehand to attack. How did I know that? I’ve explained the correct grip in the previous video. You must have a loose grip, and you should apply the pressure only at the moment you hit the ball. If you ask other Chinese coaches, they always say this same principle. For the backhand strokes, you apply the pressure on the side of the thumb (like this). So you must have the callus on the side of the thumb. For the forehand stroke, the index finger will press the racket, and the edge at the bottom of your thumb will be under pressure. That’s why the bottom of the thumb must have a big callus. Here are the best way to hold a table tennis paddle. The correct grip example that you should follow! Loose and comfortable grip helps you to increase the speed, the acceleration of your short. Therefore, the spin and the speed ehance. You should not hold the racket tightly with the middle, and the ring finger. Just hold by index and thumb. This method is proven by many top Chinese players. Apply the pressure on the thumb for the backhand strokes. For the forehand stroke, apply the pressure by using the index finger. Learn to apply the pressure only at the moment of contact. Another point that I want to emphasize is: You should hold the racket so that it can make a “straight line” with your forearm like this. This is very important! This is a very important point. Many amateur players just hold the racket the wrong way. They hold the racket too perpendicular. Which is not good! If you hold like this, you can’t make a powerful topspin shot. But you can only block on your forehand side. Fix it now! Or you can’t improve your techniques! I really love coaching in table tennis. I want to say that table tennis is very technical. So you need to practice table tennis techniques in small details. These small details can make you from a good player become the best player. 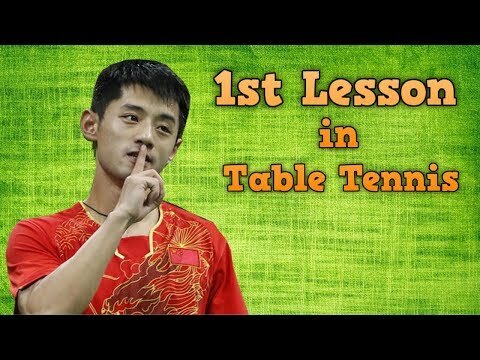 Please share this table tennis tutoring for your teammate who wants to practice table tennis. I really liked the way the grip on the handle was explained. I think I have been holding the bat too firm and must loosen my grip and try to hold the bat parallel to my forarm. When I read about correct play it seems to sink in a lot more than just watching videos. Thank you. We are doing some training at GVHTT. With Kreanga, Cedric, Liam, Quentin. Liam holds the bat very loose. that’s why his backhand is so smooth and spinny.